Whether you will be printing invoices, brochures, reports etc., you will definitely need a fast and reliable printer for your small business. It will absolutely be an essential part of your business productivity and even help you save the expense and inconvenience of using a printing service. But how can you be sure that you are buying the right printer? 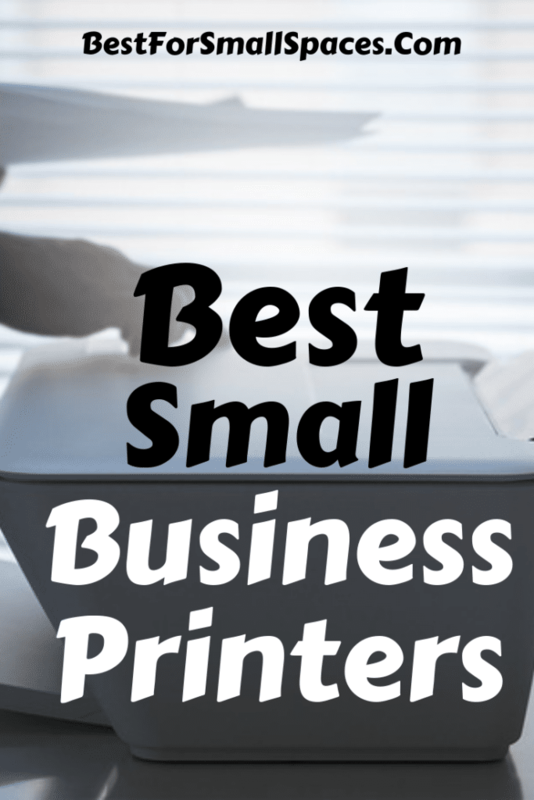 Well, to give you a much better idea of which printer is the right one for your business, I’ve listed down below the best small business printers you can buy today. These printers will not only help you cope with your office’s demands but they can also be flexible enough to keep up if your business expands. If you want to know what these amazing printers are, then please keep on reading below. When it comes to small business printers, reliability is the first thing I always consider and Brother HL-L8360CDW did not disappoint me. This printer has been designed for business use; in fact, it can accommodate a range of printing requirements, including countless color printing. As expected, this printer is a speedy machine, it can print your documents at a speed of up to 33 pages per minute. This is significantly faster compared to similar models in the range. Plus, it has a large 250-sheet paper tray so we can minimize the time we spend in replacing the paper. But this doesn’t end here, you can also expand the trays of this printer and get up to 1,300 pages of paper storage. This will give you the versatility to choose how much storage your office requires according to your printing needs. But what is even more impressive is the printer’s print quality. It produces perfect text documents with crisp and dark text very similar to other high-end models. Printing documents with photos or charts will also not be a problem as it produces very sharp and well-saturated photos and graphics. It supports higher yield toner cartridges that are capable of printing as much as 6,500 pages each cartridge. This means you can now print a lot more pages per cartridge, saving you a lot of money. It has an automatic duplexing feature that allows printing on both sides of each page so you can save more paper. This printer is very hassle-free to use. It comes with a 2.7-inch touchscreen display that is easy to navigate and direct print from most business cloud services. It also offers security features which allow you to set up unique profiles for every employee. This printer has been programmed to accommodate 200 users. This printer is also compliant with a number of environmental standards like Energy Star. As a result, this model will not only help your business increase its productivity and work more efficiently, but is also more energy efficient, reducing its impact on the environment. 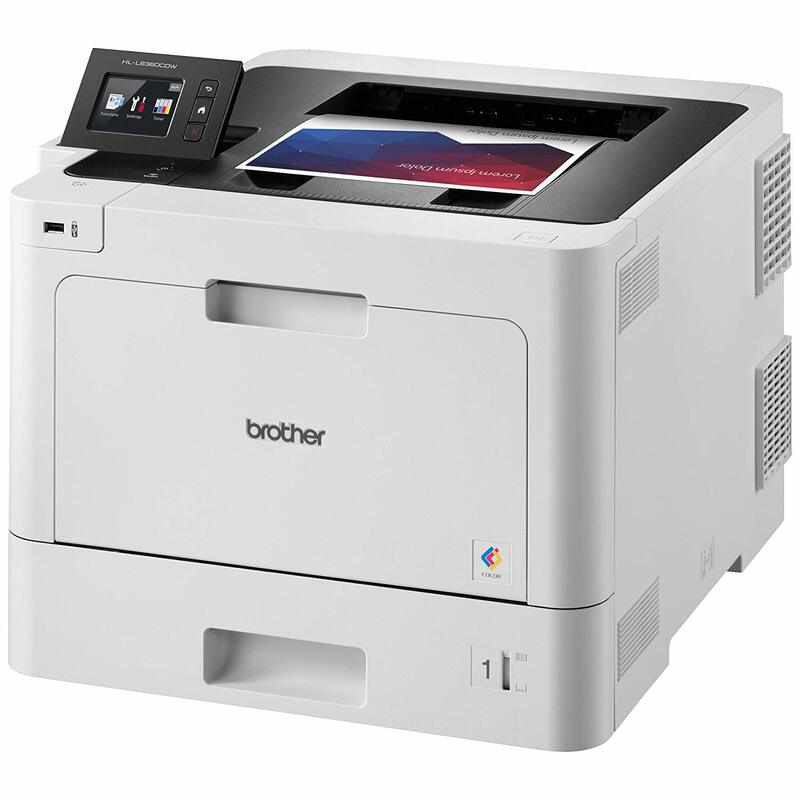 So if your small office prints more than a thousand pages a month and you’re looking for a single-function printer that can keep up, the Brother HL-L8360CDW is definitely a great choice. 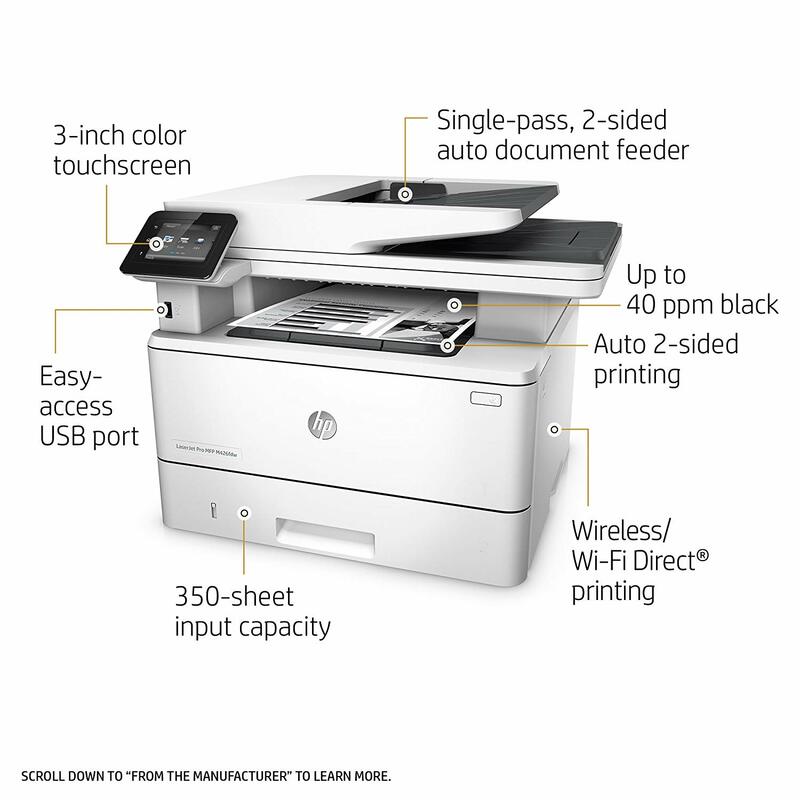 The HP Laserjet Pro M426fdw has a full set of multi-function features so it will deliver fast printing. This printer has been rated to print at 38 pages per minute, which is already faster for its range. Plus this device includes a total paper handling capacity of a 250-sheet paper drawer and another 100-sheet multipurpose tray, which means there will be less time spent replenishing paper trays. It features standard automatic duplex printing that makes this printer cost-efficient, both in energy consumption as well as paper usage. Printing on both sides of the paper has been made possible by this feature, allowing you to save up to 33% of your usual paper use. This printer has an Automatic Document Feeder that is capable of handling up to 50 sheets at one go. It can scan both legal-size pages and scan in duplex. It has amazing connectivity choices. In addition to connecting the printer through the standard USB 2.0 as well as Ethernet ports, it also caters wireless printing by using Wi-Fi Direct and Near Field Communication. Mobile printing is also available through HP ePrint, Google Cloud Print, Apple AirPrint and Mopria. It produces remarkable fine copy print, the black text on plain paper just looks amazing. It does its job quietly too. Most of all, HP Laserjet Pro M426fdw has a compact design that will never cause you problems looking for enough flat space to place it in your small office. Here is another all-in-one inkjet printer that has been perfectly designed for small business use. This model comes with several small office features that I’m sure you’d appreciate. First of all, it uses Brother’s ink-cost savings program or dubbed as the INKvestment Tank Extended Print technology that relies on conventional cartridges rather than filling on-board reservoirs from bottles. These are long-lasting ink cartridges and are said to last you for a year. The black cartridge can print up to 3,000 pages while the color can print up to 1,500 pages. And if you’re afraid you’ll never know how much ink you have left, don’t worry. Brother has added a gauge in the printer which counts the number of pages you already have printed and gives you estimates on how many you have left. This is much more accurate than those printers that display ink volume indicators. It also monitors the ink levels and lets you know when they are already low. Its printing speed is enough to perform small office duties at 12 pages per minute for monochrome pages and 10 pages per minute for color. If you will use the duplexer to make two-sided prints, the printer will print text documents at 4 pages per minute. This printer also delivers high-quality print. The text looks crisp, sharp and dark while the graphics are printed with so much detail. The colors look well saturated and pretty accurate too. Using this printer is a breeze. It comes with a 2.7-inch touch screen that provides easy-to-understand instructions. It supports almost every connectivity choice you can think of such as connecting the printer to a single PC using a USB as well as Ethernet, Wi-Fi, Wi-Fi Direct and Near Field Communication. Mobile connectivity is also available like Brother Cloud Connect that will allow you to remotely print to and scan from email, fax, the cloud, and other Microsoft Office Programs. It supports most of the cloud sites like OneDrive, Google Drive, Dropbox, etc. Third-party mobile connection is also available via Google Cloud Print, Apple AirPrint, Mopria, etc. There’s a USB memory port and an SD Card slot that can be found on the lower left of the printer’s front panel so you can print or scan to a USB thumb drive or memory card. Setting up the printer is also a piece of cake. Following the instructions and prompts on how to add the printer to your wireless network is very simple. Overall, this Compact Printer is versatile and easy-to-use, long-lasting and is able to handle the workflow efficiently. It provides a lot of features that can be very helpful for your small office and at a reasonable price. The number of business professionals, or any other workers that are constantly on the go and need to work remotely is growing rapidly today. This is great for employers because they get to save on office space and great for employees because they will be able to take advantage of flexibility. This only explains why a mobile printer is the best addition to every small business. And if you are looking for one, then you need to consider the Canon PIXMA iP110. 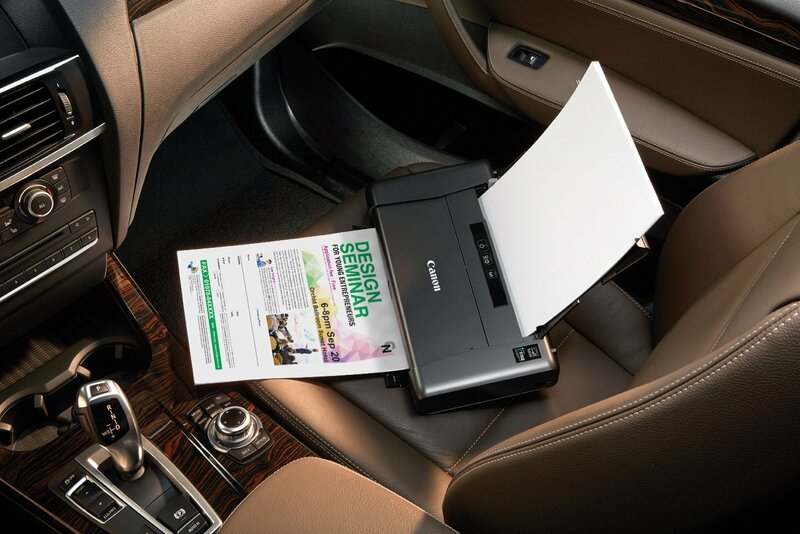 Ever since this printer has been introduced by Canon, it has remained as the standard mobile printer in the industry. It has a compact, lightweight and portable design that makes it the perfect printer for every business professional who’s always on the move. But despite its portable size, it offers reasonable speed and suitable paper handling for an inkjet printer. It can actually print 20 monochrome pages per minute while color print, as well as photos, are printed instantly within 53 seconds. For its paper handling, its feed tray can hold a maximum of 50 sheets of paper which is a good number for a portable printer. This device can also print decent document pages and photos, thanks to its five-ink imaging system composed of the standard CMYK (cyan, magenta, yellow and black) process colors, including a Pigment Black that can darken text and all-black areas on the page. It supports Wireless PictBridge that allows you to wirelessly print from various Canon digital cameras. Wi-Fi Direct, Near Field Communication, and Mobile printing are also available. This printer supports Canon’s Pixma Printing Solutions, Google Cloud Print, Apple’s AirPrint, One Drive, Google Drive, Dropbox, etc. Canon also provided its very own version of Wi-Fi Direct through the Access Point mode, giving you greater flexibility. It features an automatic turn-on feature. This means that when you send a printing job to the printer, it will automatically turn itself on to print it. It comes with a control panel for basic functions. 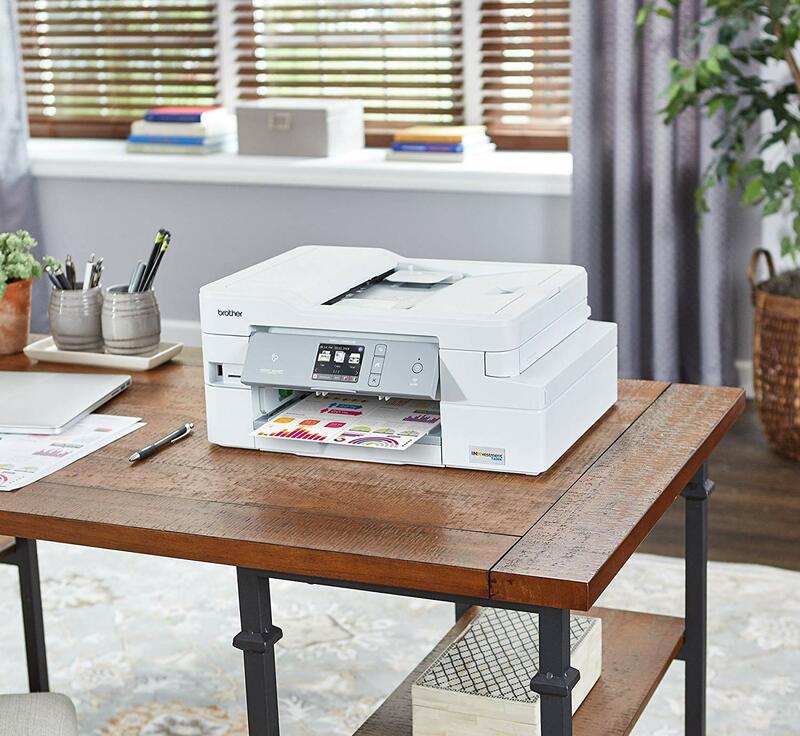 As long as you have a Canon PIXMA iP110, space constraints will no longer be a hassle for you as this Compact Portable Business Printer can fit right in, even on a small desk. Its impressive classy design is definitely a bonus too. 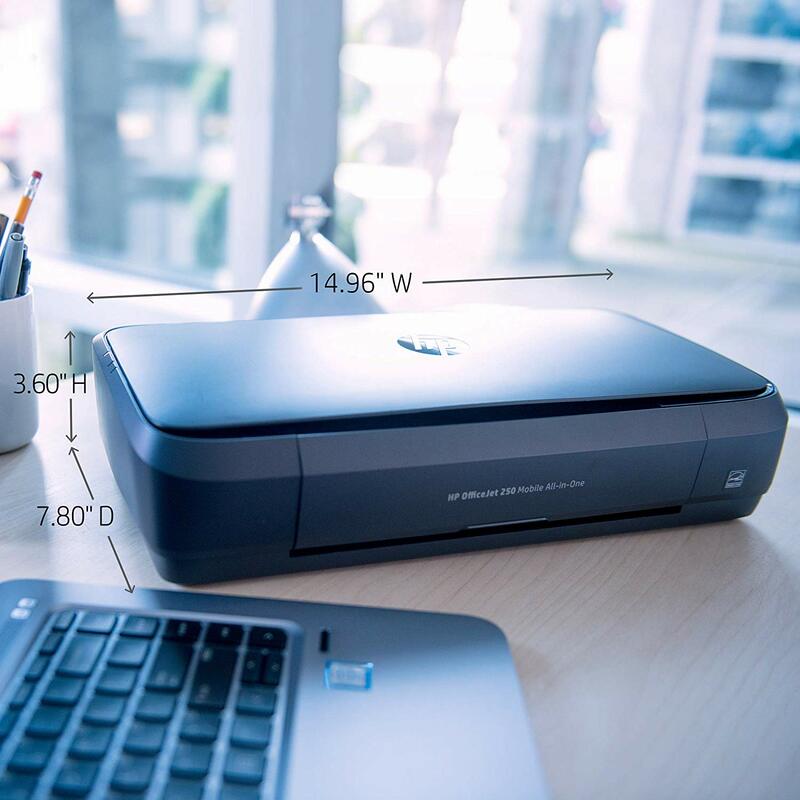 If there’s one thing your small business needs, it would definitely be an all-in-one portable printer and the HP OfficeJet 250 is the most feature-rich all-in-one printer your money can buy. This portable printer can be with you wherever you need it. You can just stick it into your suitcase or backpack and you’re good for on-the-go prints. But the size and the weight of this printer are not the only things that make this model highly portable. It also comes with an easy-to-use battery that features a built-in meter to let you know the remaining power. The battery can help you print 500 pages before it requires recharging. When it comes to performance, it squeezes great printing, copying and scanning into a package. Whether you are printing business contracts and agreements with simple text or the PowerPoint slides you need to study with full color, this compact inkjet will give you incredible high print quality. It has amazing connectivity options: you can plug it into a PC with USB, you can print from your laptop, tablet or smartphone using Wi-Fi and you can also print from other mobile devices via Bluetooth. Though it does not support Google Cloud Print as well as Apple AirPrint, HP has its own HP ePrint app. It has a large capacity even for a portable printer. Its paper input feeder can hold up to 50 pages of standard paper. It comes with an automatic document feeder that allows you to run documents with several pages through its scanner. It has a 2.8-inch color touch that flips on the printer’s right side. It is pretty easy to navigate too. It comes in a classy and sturdy design, its plastic enclosure comes in a matte black finish that looks neat and clean. Despite the small size of HP OfficeJet 250, it has been hailed as One Of The Best Portable Printers you will ever use. Well, with its excellent print quality and performance that is almost on the same level with full-size printers, who could argue with that. When it comes to choosing a printer for your small business, it is very important to weigh up the different features to make sure that the printer will meet your expectations regarding printer performance and functions. 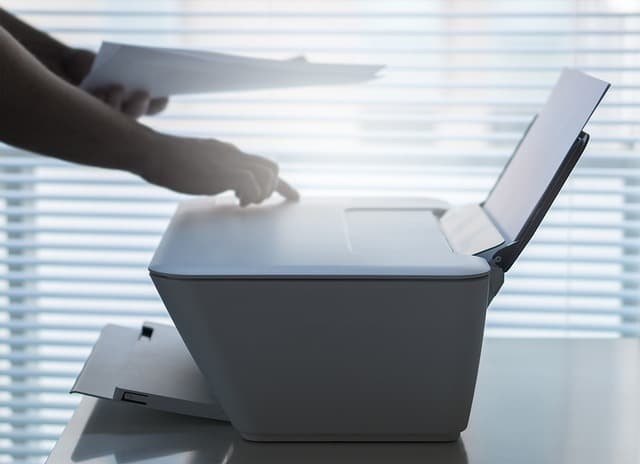 First of all, you might want to consider all-in-one printers that will combine printing, scanning, copying and faxing capabilities into one package. This will help you save space and make maintenance a hassle-free task. You should also know which printer to choose: a laser printer or inkjet printer? One main factor you need to consider when determining between these two is the cost. In general, inkjet printers have an initially much cheaper cost. The Inkjet printer itself, as well as the initial ink cartridge, are being sold much cheaper compared to a laser printer and its toner cartridge. However, you should take note that ink cartridges tend to run out more rapidly, ending up more costly in the long run. Moreover, laser printers run faster once they get warmed up; so if your office requires long print jobs, a laser printer could be the best choice. On the other hand, inkjet printers perform really well when it comes to graphics, especially photos; so if your job requires printing a number of design-heavy documents, you should opt for ink. Of course, you’d also love for your office to own a printer with fast printing speeds, no matter how much you print. So don’t forget to check the printers’ page per minute (ppm) capacity. Apparently, printers with high ppm capacities can cost a lot more and we don’t want to spend a lot, especially when still building up a small business. A good small business printer is found in the range between 21 and 42 pages per minute. Small business printers should also be sturdy enough to handle numerous people sending documents to it throughout the day. It should also be easy on the pocket, both in terms of power consumption and consumables such as paper and ink. It should also be app, mobile and cloud-ready to help you execute everyday tasks faster and easier, helping you improve your office’s productivity. If you would like to see some small printer reviews suitable for home use, then follow the link. To see some reviews on small paper shredders suitable for a small business, follow the link. Buying the wrong printer can definitely have a financial impact on your business and this is something we don’t want to happen. Fortunately, choosing the best small business printers do not need to be puzzling, time-consuming or a daunting task. As long as you know the printing habits of your small office, I’m sure you will get to choose the best one for your business. I hope reading this article will help you purchase one that will suit your business needs. The printers I’ve mentioned above are all fast, accurate and can be with you as you grow your company. They are definitely excellent choices.